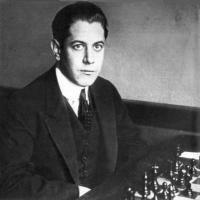 José Raúl Capablanca y Graupera was born on November 19, 1888 in Havana, Cuba. His father was an army officer who liked to play chess. One day, the young boy noticed his father make an illegal move with his knight, accused him of cheating, and then demonstrated what he had done. Capablanca was taken to the Havana Chess Club when he was five, where the leading players found it impossible to beat the boy when giving him a queen advantage. When he was twelve years old he defeated the Cuban Champion Juan Corzo in an informal match by the score of 4 wins, 3 losses, and 6 draws; in the summer of 1904 his parents sent him to New York to study English and prepare to enter Columbia University. In 1906, he won in a rapid chess tournament ahead of the reigning World Chess Champion, Emanuel Lasker. In 1909 he achieved a sensational win in a match against US Champion Frank Marshall crushing him by 8 wins to 1 with 14 draws; he was only 20 years old. Marshall insisted that Capablanca be allowed to play in a tournament at San Sebastian, Spain in 1911. It was one of the strongest tournaments of the time. All of the world's leading players except world champion Emmanuel Lasker were in attendance. At the beginning of the tournament Ossip Bernstein and Aaron Nimzowitsch objected to Capablanca's presence because he had not won a major tournament. But after Capablanca won his first round game against Bernstein, with an effort which was to win the tournament's brilliancy prize, Bernstein quickly acknowledged Capablanca's talent and said that he wouldn't be surprised if Capablanca won the tournament. Nimzowitsch took offense when Capablanca made a comment while watching one of his blitz games, and remarked that unproven players should hold their tongues in the presence of their betters. Capablanca quickly challenged Nimzowitsch to a series of fast games, which he won easily. The assembled masters soon concluded that Capablanca had no equal at fast chess, a distinction which was to remain his until virtually the end of his life. Capablanca went on to win his tournament game with Nimzowitsch; Capablanca had astounded the chess world by taking first place at San Sebastian. In 1911, Capablanca challenged Emanuel Lasker for the world championship. Lasker accepted his challenge but proposed seventeen conditions for the match. Capablanca disapproved of some of the conditions, and the match did not take place. The St. Petersburg 1914 chess tournament was the first in which Capablanca played with the World Champion under normal tournament conditions. This event was arranged in an unusual way: after a preliminary single round-robin tournament involving 11 players, the top five were to play a second stage in double round-robin format, with scores from the preliminary tournament carried forward to the second contest. Capablanca placed first in the preliminary tournament, 1½ points ahead of Lasker, who was out of practice and made a shaky start. Despite a determined effort by Lasker, Capablanca still seemed on course for ultimate victory. However, in their second game of the final, Lasker reduced Capablanca to a helpless position and Capablanca was so shaken by this that he blundered away his next game to Siegbert Tarrasch. Lasker thus finished half a point ahead of Capablanca and 3½ ahead of Alekhine. Alekhine commented: "His real, incomparable gifts first began to make themselves known at the time of St. Petersburg, 1914, when I too came to know him personally. Neither before or afterwards have I seen, nor can I imagine as well such a flabbergasting quickness of chess comprehension as that possessed by the Capablanca of that epoch." It is sufficient to say that he gave all the St. Petersburg masters the odds of 5–1 in quick games – and won! With all this he was always good-humored, the darling of the ladies, and enjoyed wonderful good health – really a dazzling appearance. That he came second to Lasker must be entirely ascribed to his youthful levity – he was already playing as well as Lasker. In the ten years after this tournament (from 1914 to 1924) he lost only one game and the chess world was beginning to think he was invincible. However, Capablanca had to wait another seven years until he could prove he was the world champion. In January 1920, Emanuel Lasker and Capablanca signed an agreement to play a World Championship match. Because of the delay, Lasker insisted that if he resigned the title, then Capablanca should become World Champion. Lasker then resigned the title to Capablanca on June 27, 1920, saying, "You have earned the title not by the formality of a challenge, but by your brilliant mastery." When Cuban enthusiasts raised $20,000 to fund the match provided it was played in Havana, Lasker agreed in August 1920 to play there, but insisted that he was the challenger as Capablanca was now the champion. Capablanca signed an agreement that accepted this point, and soon afterwards published a letter confirming. They played a match in Havana in 1921, and Capablanca defeated Lasker +4 -0 =10. This feat of winning the world title without losing a game to the incumbent went unequalled for almost eight decades, until Vladimir Kramnik won over Garry Kasparov +2 -0 =13 in 2000. In December 1921 he married Gloria Simoni Betancourt. They had a son, Jose Raul in 1923 and a daughter, Gloria in 1925. Capablanca won the London tournament of 1922 with 13 points from 15 games with no losses, In 1922, Capablanca also gave a simultaneous exhibition in Cleveland against 103 opponents, the largest in history up to that time, winning 102 and drawing one – setting a record for the best winning percentage ever in a large simultaneous exhibition.